The first settler to arrive on the land that is now Running Y Ranch Resort in Oregon was Wendolin Nus, who built a homestead and rock wall (still standing) in 1866. Nus later resettled to a location on the Link River, and parcels of land within the present Running Y Ranch were first purchased in 1875. Cattle were eventually driven out on the marshes to feed on grasses, which included sedges and tules. The ranchers then harvested wild hay for winter use. Cattle would feed on the marshes until after snow fell, often until Christmas, before they were driven to higher ground for overwintering. Klamath County was formed in 1882, with the town of Linkville renamed to Klamath Falls. After the severe winter of 1889-90 that killed thousands of cattle, much of the ranch was sold and in 1897, the first dike was constructed on the property at the head of Wocus Marsh. Drainage channels also were constructed as part of what was called the Wocus Reclamation and Irrigation project. With water levels lowered, cattle could pasture over most of the 4,157 acres of Wocus Marsh. By 1936, most of the property's wooded areas had been logged heavily. With drainage improvement in place, crops like rye grass were grown first, with a profitable transition to growing grass and other seeds (bluegrasses, Timothy, clover, and bent grasses) even during the great depression in the late 1920’s. Bent grasses became the most popular crop because of the growing international interest in golf course construction and the need for suitable grasses for golf greens. Cattle were introduced into the farming operation in the early 1940’s. Running Y Ranch Resort occupies 3,600 acres with frontage along the southwest shore of Klamath Lake. The Caledonia Marsh once occupied approximately 1,000 of these acres, which were reclaimed for agricultural use shortly after WWI. In 1966, the Geary family sold 8,000 acres of the ranch to Ruth Teasdale, a resident of northern California. The Gearys retained the original Geary ranch land on the northwest side of the present Running Y Ranch. The ranch was sold again in 1974 to Roy Disney, of the Disney Corporation, and Peter Daily, and was renamed the Double D Land Company. Under the management of Don Hagglund, who was hired by Double D in 1976, the ranch operation focused on growing grain, hay, beets, and potatoes, and grazing cattle for other ranchers on the 5,000 acres of the ranch. 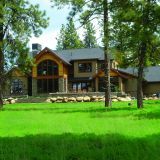 In 1994, the JELD-WEN Corporation of Klamath Falls bought the ranch. Through efforts of the Eagle Crest Properties - a JELD-WEN subsidiary - 3,600 acres of the property was developed into The Running Y Ranch Resort. The remainder of the 9,600-acre plot was managed as a farm and ranch, with conversion of most of the Caledonia Marsh land back to marsh. Plans to build a destination resort on the property were announced in June 1994. In March 1995, Klamath County adopted the destination resort ordinance enabling the Running Y to proceed with resort construction. In August 1995 Arnold Palmer held the groundbreaking ceremony for the golf course. The Phase I plat of 82 home sites was approved by the Department of Housing and Urban Development on August 8, 1996, and Phase II plat of 80 home sites was approved on December 13, 1996. On November 19, 2010, a joint venture comprised of Northview Hotel Group, LLC, and a subsidiary of funds managed by Oaktree Capital Management , L.P., acquired the Running Y Ranch from JELD-WEN, Inc.
Running Y Ranch was purchased by Bill & Lynelle Lynch in October, 2014, and is currently under the management of CoHo Services. In 2015 the new owners rebranded the property with the now recognized Running Y Ranch Resort logo. The property now features a 18-hole golf course, miniature golf course, 7,000 sq. 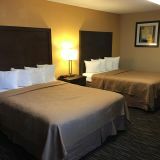 ft. of meeting space, an 82-room Lodge, vacation rentals, town homes, chalets, a spa, fitness center with indoor pool, shopping village with café, and two onsite restaurants.